The main issue in the management of the two-phase liquid-dominated geothermal field is a rapid pressure decline in the reservoir which affects steam supply to the power plant. The changes of reservoir characteristic due to mass and heat extraction from the reservoir can be learned through a numerical simulation under numerous strategies production-injection. The model developed on liquid-dominated geothermal fields are assessed with various scenarios of production strategies (steam cap, brine reservoir, and combination) and injection strategies (deep, shallow, centered and dispersed), for generation of 110 MW and 220 MW using separated steam cycle. A full factorial scenario of 32 production-injection strategies has been successfully carried out. The results show a relatively low decrease in reservoir pressure and steam flow rate for a production strategy combined with the steam cap and brine reservoir, with deep and dispersed injection strategy. From the simulation, it can be concluded that the strategy for sustainable production is a production of 25% from steam cap and 75% from brine reservoir, dispersed and deep reinjection with 9 make-up wells from the steam cap. The implementation of production-injection strategy needs to be planned right from the beginning of exploitation, therefore, the strategy can adapt to changes in reservoir characteristics. Keywords: Reservoir liquid-dominated, Steam cap and Sustainable production. Liquid-dominated hydrothermal reservoir is most widely developed for power plant generation. As known, the sustainability of steam production from this type of reservoir has been a major concern since the massive mass production from the reservoir can significantly decrease reservoir pressure over time. The pressure drop simultaneously can induce reservoir to boil. According to Grant , et.al in  and , there are two possibilities that can occur in the liquid-dominated reservoir after production. The steam is mixed uniformly and the fluid dryness around the production well increases. The second possibility is that the steam zone and water zone will be separated due to gravity, therefore steam cap is formed at top of reservoir. With a good vertical permeability, the reservoir boiling causes the steam which has lower density than liquid phase, moves up and is formed at top reservoir. Both of this process occurs in most areas or in the whole reservoir. This phenomenon occurred in several geothermal fields with high power plant capacity, such as Wairakei – New Zealand [1,2,3,4,5], Tongonan – Philippines [6,7,8,9], Awibengkok – Indonesia [10,11,12,13], and Wayang Windu – Indonesia [14,15]. Common practice from several fields, such as Wayang Windu and Awibengkok, steam cap zone is more favorable to produce, because it is shallower therefore from drilling point of view, the drilling cost, can be reduced. Number of injection wells and separators may be reduced since less liquid produced. This potential cost reduction from a geothermal developer’s point of view, it makes mass and heat exploitation from a steam cap somehow more interesting. The number of research in numerical simulation developed for liquid-dominated reservoir is fewer than those for single-phase (liquid) reservoir or vapor-dominated reservoir. Liquid-dominated reservoir can be said to be more challenging to model since one has to construct a model of vapor-dominated reservoir underlying liquid-dominated reservoir. Some results from the study  encounter a difficulty in modeling these types of reservoir. The model was run under various production-injection strategies. By observing pressure and temperature drop, vapor saturation and mass flow in reservoir model as function of time, this model can predict the performance of the reservoir with various production-injection strategies to exploitation time. The objective of this study is the optimum scenario of production-injection and make up well strategy that can be learned in order to manage the mass and heat production from the reservoir for a sustainable geothermal field management. In this study, there are three production strategies introduced, as follows; fluid produced from steam cap only, fluid produced from brine reservoir only located below steam cap, and fluid produced from both steam cap and brine reservoir with several fractions of steam production. As for the injection strategies, there are two strategies, as follows; fluid injection into both deep shallow reservoir, and peripheral injection strategy which are either centered or dispersed. The synthetic numerical model was developed based on characteristic of typical two-phase liquid-dominated reservoir. Using 4 (four) different strategies both production and injection for generation of 110 MW and 220 MW, therefore the model is run for 32 strategies by full factorial. The further study was to forecast the reservoir performance for 30 years. The make up well scenario is to produce them either from brine reservoir only, steam cap only, or both of them to sustain steam the steam supply for power generation of 220 MW. This research was supported by P3MI (Research, Community Service and Innovation Program) for the Reservoir Engineering Research Group at FTTM ITB. The TOUGH2 simulator was supported by BAGUS – SATREPS. Grant, M.A., Donaldson I.G., Bixley P.F., Geothermal Reservoir Engineering, 1st Edition, Academic Press, Oxford, 1982. Grant, M.A. & Bixley P.F., Geothermal Reservoir Engineering, 2nd Edition, Academic Press, Oxford, 2011. Clotworthy, A., Response Of Wairakei Geothermal Reservoir To 40 Years Of Production, World Geothermal Congress, 2000. Mannington, W.I., O’Sullivian, M.J., Bullivant, D.P., Clotworthy, A.W., Reinjection at Wairakei-Tauhara: A Modelling Case Study, Workshop on Geothermal Reservoir Engineering 29th, SGP-TR-175, 2004. Bixley, P.F. & Clotworthy, A.W., Evolution of the Wairakei geothermal reservoir during 50 years of production, Geothermics, Vol 38, pp. 145-154, 2009. Salonga, N.D. dan Siega, F.L., Evaluating the Expansion and Sustainability of the Upper Steam cap in the Tongonan Geothermal Field (Philippines) Using Gas Chemistry, Geothermal Resources Council Transactions, Vol. 23, 1999. Seatres, J.S., Salonga, N.D., Saw, V.S., MAxino, D.A., Reservoir Manajemen Strategies To Sustain The Full Exploitation Of Greater Tongonan Geothermal Field, Philippines, World Geothermal Congress 2000. Dacillo, D.B., Colo, M.H., Andrino, R.P., Alcober, E.H., Tongonan Geothermal Field: Conquering the Challenges of 25 Years of Production, World Geothermal Congress, 2010. Gonzales, R.C., Field Management Strategies for the 700 MWE Grater Tongonan Geothermal Field Leyte, Philippines, World Geothermal Congress, 2005. Acuna, J.A., Stimac, J., Azwar, L.S., Pasiki, R., Reservoir Manajemen at Awibengkok Geothermal Field, West Java, Indonesia, Geothermics, Vol 37, pp. 332-346, 2008. Stimac, J., Nordquist, G., Suminar, A., Azwar, L.S., An Overview of the Awibengkok Geothermal System, Indonesia, Geothermics, Vol 37, pp. 300-331, 2008. Ganefianto, N., Stimac, J., Azwar, L.S., Pasiki, R., Parini, M., Shidarta, E., Joeristiaonto A., Nordquist, G., Riedel, K., Optimizing Production at Salak Geothermal Field, Indonesia, Through Injection Manajemen, World Geothermal Congress, 2010. Pasiki, R.G., Salak Reseroir Overview, unpublished. Mulyadi & Ashat, A., Reservoir Modelling of the Northern Vapor-Dominated Two-Phase Zone of the Wayang Windu Geothermal Field, West Java, Indonesia, Workshop on Geothermal Reservoir Engineering 36th, SGP-TR-191, 2011. Bogie, I., Kusumah, Y.I., Wisnandary, M.V., Overview of The Wayang Windu Geothermal Field, West Java, Indonesia, Geothermics, Vol 37, pp. 347-365, 2008. O’Sullivan, M.J., Karsten, P., Lippmann, M.J., Geothermal Reservoir Simulation: The State-of-Practice and Emerging Trends, World Geothermal Congress 2000. Pratama, H.B. 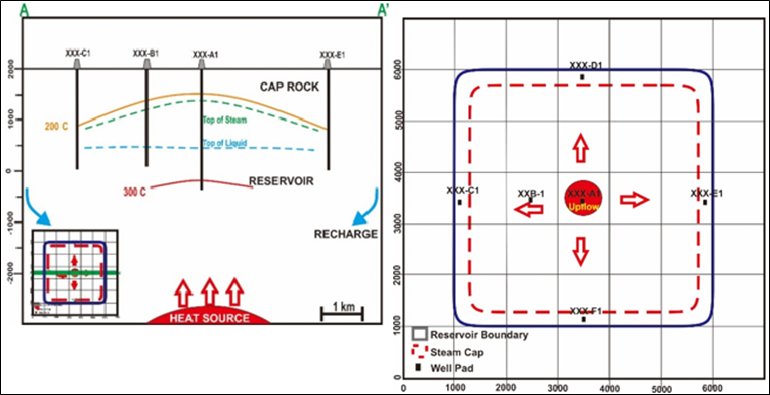 & Saptadji, N.M., Numerical Simulation for Natural State of Two-Phase Liquid Dominated Geothermal Reservoir with Steam Cap Underlying Brine Reservoir, IOP Conference Series: Earth and Environmental Science, Vol 42. doi:10.1088/1755-1315/42/1/012006. Goff, F., & Janik, C.J., Geothermal Systems, Encyclopedia of Volcanoes, Academic Press, Chapter- 49, pp. 817-834, 2000. White, D.E., Muffler, L.J.P., Truesdell, A.H., Vapor-dominated hydrothermal systems compared with hot-water systems. Econ. Geol, 1971. D’Amore, F. & Truesdell, A.H., Models for steam chemistry at Larderello and The Gesyers, Workshop on Geothermal Reservoir Engineering 4th, 1979. Allis, R., Insights on the Formation of Vapor-Dominated Geothermal Systems, World Geothermal Congress, 2000. DiPippo, R., Geothermal Power Plants: Principle, Application, Case Studies and Environmental Impact, 2nd Edition, Butterworth-Heinemann is an imprint of Elsevier, Oxford, 2008. Pratama, H.B., & Saptadji, Study of Production-Injection Strategies of Synthetic Geothermal Reservoir Liquid-Dominated Model with Numerical Simulation, 37th NZGW, 2015. Pratama, H.B. & Saptadji, N.M., Study of Sustainable Production in Two-Phase Liquid Dominated with Steam Cap Underlying Brine Reservoir by Numerical Simulation. IOP Conference Series: Earth and Environmental Science. Vol 103. doi:10.1088/1755-1315/103/1/012005.